Pixie Crunch™is a trademark of Purdue University. I've grown 8 of these trees over the years, 3 on M7 and 5 on G30... all in North Carolina. While fireblight and cedar-apple rust can be severe, they can be grown in the Southeast with a good fungicide/insecticide program. They have a great flavor and the crispness is exceptional. Of the over 50 kinds of apples I have grown, this was the most popular with folks. It is among my top 10 favorite apples for fresh eating. I planted 5 varieties at the same time - 2 disease resistant, 2 heirloom and the Pixie Crunch. Cedar apple rust and fireblight are problems here and the Pixie Crunch needed more attention than the others put together. Since my goal was as low maintenance as possible, the tree had to go. It already had half the limbs removed due to fireblight and the rest of the leaves all showed cedar apple rust even after being on a spray schedule. I purchased a dwarf Pixie Crunch a few years back. 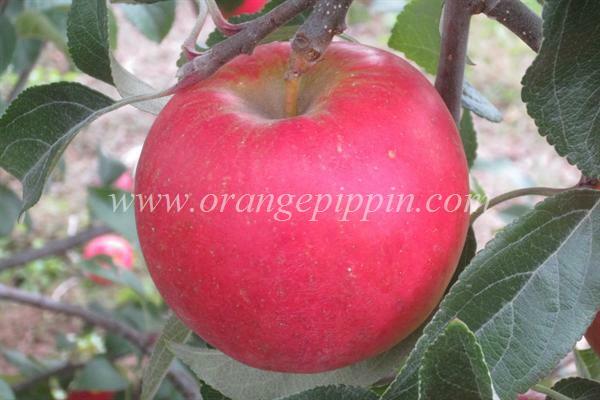 The first year it produced one Apple, which was very crisp and sweet. The following winter was harsh and a heavy snowfall broke the tree off at the ground. I have since purchased another one which is growing very well and hopefully will produce some fruit this year. I love the crispness and the sweet, juicy flavor of this apple. Small fruit with a great hard, crisp, breaking texture. A bit more dense and a bit sweeter than Honeycrisp. An average amount of juice, not great complex flavor but very good. Classic apple flavor with a bit grassy smell. What nice little apple. Crisp, with a nicely balanced sweetness and a lovely perfume. Perfect size for a linch box or for after dinner with wanuts and cheese. These apples are crisp, juicy, sweet, slightly tart. A great lunch box apple: small, and delicious.